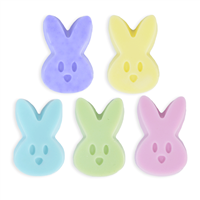 These chocolate scented bunny soaps will make the perfect basket stuffers. Just be sure your label says "SOAP" so they don't get confused with the real thing! Or, switch out the fragrance and make these an adorable baby shower favor. Your guests will love them!